Products will typically ship within 5 business days of receiving your order. The bulk of our products ship from our Rochester, NY distribution facility. Once your order leaves our facility, normal FedEx delivery will take from 2 - 5 business days depending on your shipping location. Free Ground Shipping is offered for any order over $99 within the Continental U.S. We guarantee delivery via this option within 8-12 business days, although delivery may be sooner. If you need guaranteed delivery in the Continental U.S. within 4-7 business days, that option is offered in the checkout process for $9.95 - $19.95. Depending on transit times, you may receive the item sooner that that. Please refer to the chart below for transit times throughout the country. Should you require 3 Day Select, 2nd Day, or Overnight shipping, please use the shipping calculator in the shopping cart. We accept international orders. Please email us at info@trunkoutlet.com for an international shipping quote. Shipping trunks to the major cities of Canada generally costs between US$40 and US$165 per trunk via UPS. The rate varies according to the size of the trunk. You can use our shipping calculator in your shopping cart to find out the shipping cost. If you live outside of the major Canadian Metro areas, please email us for a quote - please include your postal code. Shipping trunks to Europe generally costs about US$200 or more via postal Air and takes 6 to 14 days to receive after we ship the trunk out. We don't ship via boat to Europe. Email us for a precise quote. Customs, Duty, Import fees and Broker fees will vary from country to country. We do not know how much each country charges for these fees when a package is delivered internationally. Some countries charge them and some do not. TrunkOutlet is not responsible for any of these fees. The fees are the sole responsibility of the customer. If the customer refuses to accept delivery for any reason, the customer will still be responsible for all shipping charges. We are proud to supply our men and women in the military, as well as civilian contractors with most items on our website. We can ship smaller items through the US Postal Service to APOs and FPOs. However, trunks are too large to ship via the postal service and UPS does not deliver to APOS or FPOs. Please contact us for a shipping quote prior to placing your order at info@trunkoutlet.com. We do not ship to PO boxes or use the U.S. Postal Service unless it is an unusual situation or if we are shipping internationally. However, we do ship non-trunk items to APOs and FPOs (see below). All items are automatically shipped with insurance - there is no added cost to our customers for this service. How Many Days Should it Take for My Items to Arrive? Please take a look at the map for an approximation as to how many days it will take for your trunk or cube to be delivered once it leaves our facility. Find where you live on the map. 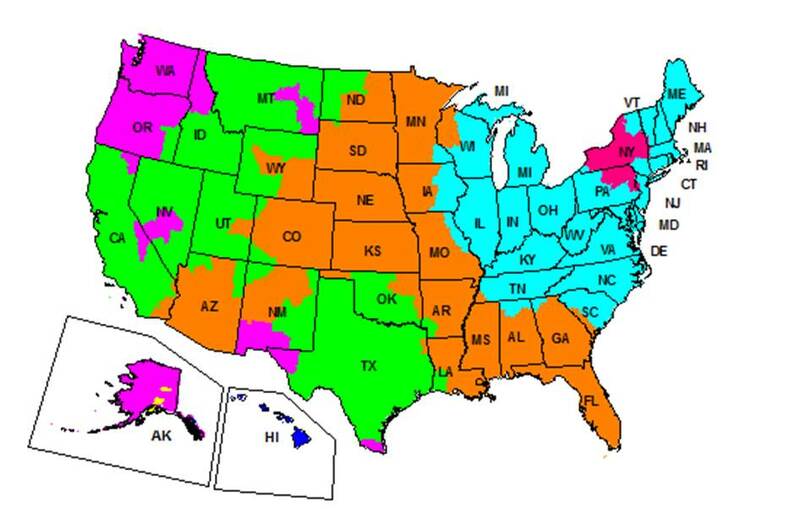 Match the color of where you live to the chart on the bottom right of the map. Each color shows the number of days for delivery. If shipping to a residential address, FedEx will deliver Tuesday through Saturday. If shipping to a business, FedEx will deliver Monday through Friday. Any FedEx Express packages are delivered Monday through Friday, unless specified. Trunks, ours or anyone elses, are not designed to be used as shipping containers. That includes shipping via UPS, FedEx, Airlines, etc... The excessive abuse that the carriers put them through will dent or scratch all trunks. If you are going to ship a trunk, we recommend you put it back in its original box and ship it in the box. If you need something beefier, please look at our Indestructo trunks search the Internet for "ATA cases". The are made specifically for shipping. However, they are much costlier than trunks.